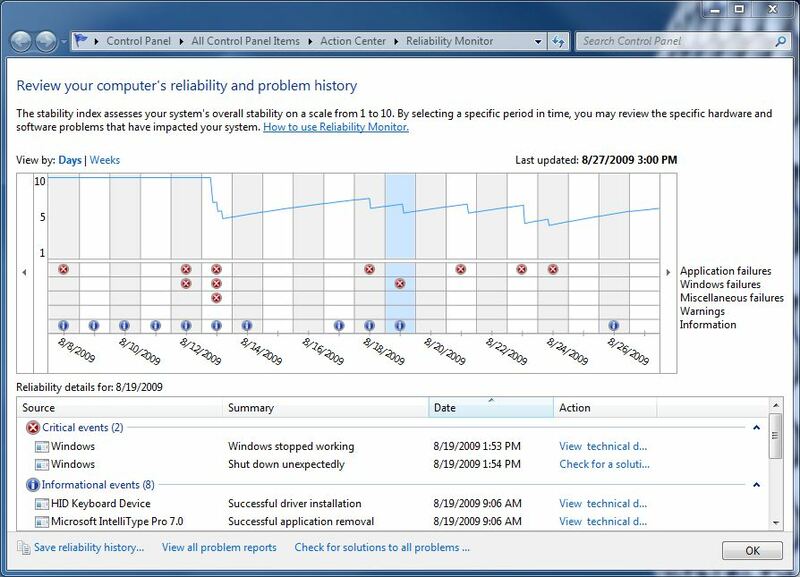 Why doesn’t Windows 7 post a reliability index any more? 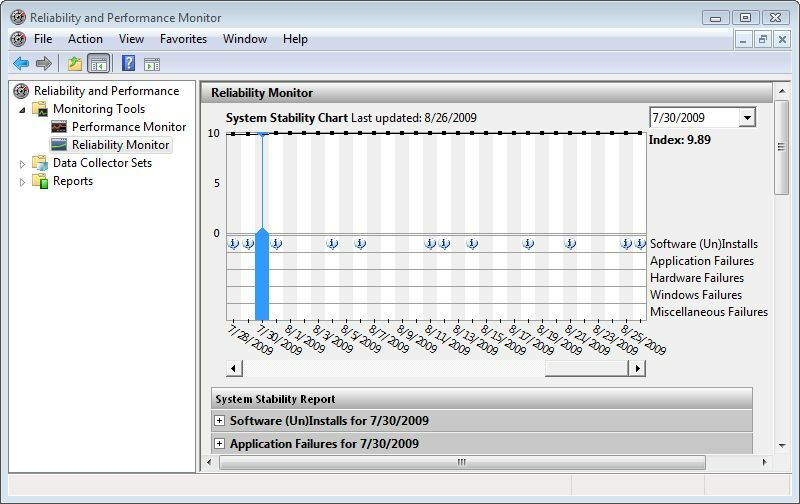 Take a look at the Reliability Monitor output for my production PC, which has been running Windows 7 since my birthday on August 8. In addition to showing why I’ve got a new motherboard waiting for me to have time to swap out with its current Gigabyte P35T-DQ6 motherboard, it also shows no numerical values for the reliability index on any given day. I’ve highlighted the most recent Windows OS failure on 8/19/2009 by way of illustration, but what I want you to note is that while you can eyeball an approximate value for the RI (reliability index) on any given day — 8/19 looks like about a 6 to me, for example — the utility no longer reports a number anywhere in its display. Of course, that number has to be around somewhere, because the utility couldn’t draw the graph without numerical data from which to plot the points. During the beta period I tried like the dickens to contact the MS beta team and tell them to please add this back in, but I’ll be darned if I could ever figure out how to get into the proper channel to deliver that feedback, let alone share it with somebody who could actually *do* something about it. Now, all I can hope is that somebody at MS will see this lament and get it scheduled for Windows Update inclusion. I think we all deserve to know what our RI value is, rather than having to guess! What say you?